NovoPRO is a superior, next-generation system for wireless presentation and collaboration. It’s designed to take business meetings, conferences and corporate presentations to a new level of collaboration and interaction. Whether in a meeting, training or huddle room, NovoPRO addresses today’s collaborative meetings in a clutter-free, dynamic environment for meeting productivity and comprehension, while encouraging teamwork. The presenter can wirelessly interact and share digital content with attendees — and vice versa — via their PCs, tablets or other portable devices in this modern, smart-meeting environment. 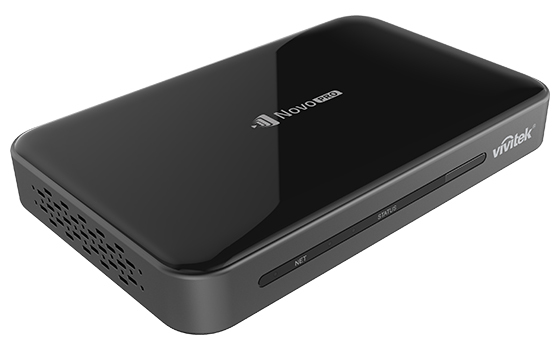 NovoPRO features 4-to-1 projection (quad screen), high-definition video streaming (up to 4K UltraHD), on-screen annotation, wireless file sharing, virtual whiteboard, QR code login and easy access to cloud-based resources. NovoPRO, a BYOD solution with up to 64 Wi-Fi or eight hotspot connections, supports all major mobile devices (phones, tablets, chromebooks and laptop computers). It allows up to four people to display their device’s screen simultaneously, supporting iPad, iOS, iPhone and Android.